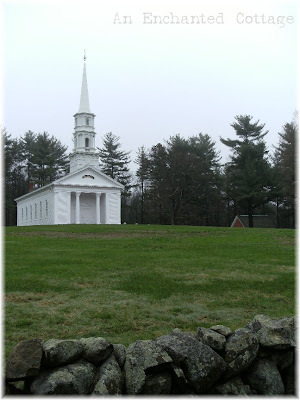 Some scenes for the movie were filmed in and around the Martha-Mary Chapel, situated on the grounds of the historic Longfellow's Wayside Inn in Sudbury, Massachusetts. ...and when Jennifer Garner, the bride, enters the church, these are the woods that are behind her. 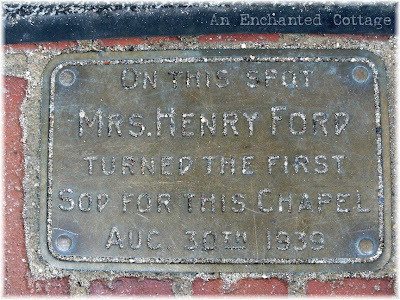 Did you know that the Martha-Mary Chapel was named for Henry Ford's mother, Martha Ford, and mother-in-law, Mary Bryant? This plaque is attached to the front steps of the chapel. 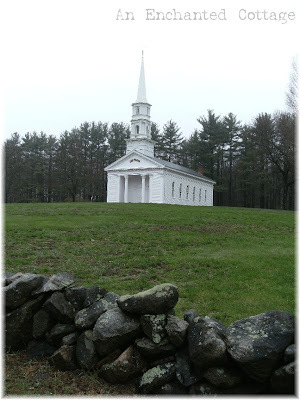 You can read a brief history on the Wayside Inn website by clicking on the above photo, or for a much more in-depth article on Ford's acquisition of The Wayside Inn and the building of the Martha-Mary Chapel, just click here. I hope you enjoyed your visit to the Chapel... I'm a sucker for romantic comedies, so I'm really looking forward to this movie! Have a wonderful weekend, everyone! What an interesting post. I adore that little Chapel. I also can't wait for that movie. Everyone that knows me says I'll be the first in line as it so my type of movie. I'm a sucker too. I also love Jennifer Gardner and I go see all her movies. Now I'm looking forward to it even more since this post. This is such a neat post! That is why I love the East coast there is so much history, and I am a history buff! I've never heard of this movie before but I love Matthew ;) hehe. Can't wait to check it out. I grew up on the North shore but the area you are talking about is so pretty. I love New England. I may have to take a ride to visit that pretty church. 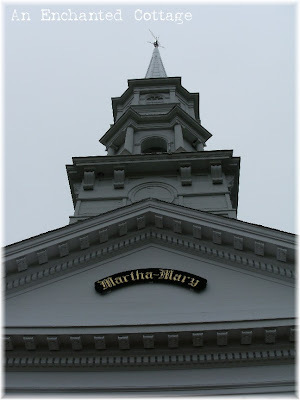 Great photos and what an interesting post on the movies from the Martha-May Chapel! 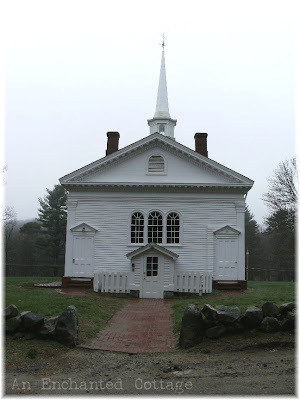 Such a beautiful little chapel; no wonder movie-makers are drawn to it! Thanks for all the pics! Oh I just have to tell you! 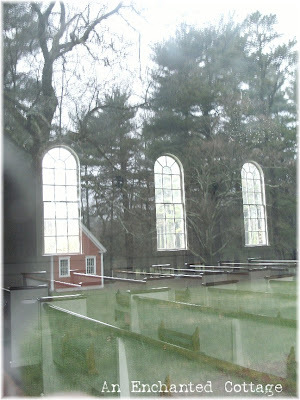 There is an almost identical Martha-Mary Chapel on the grounds of the Henry Ford Museum in Dearborn! I've been to many weddings there and in my young days, sang at quite a few! Obviously its named for the very same Ford family member. I had no idea there was one in Massachusetts, too! Oh, I must see this film! I love Jennifer Garner. Those dimples are just adorable. And what an incredible cast! I love the photos and the trailer. Thanks for sharing with us. Such a pastoral setting. hello Donna; That is a gorgeous Chapel, I can see why they love to film there. The photos you took are so pretty. I love the romantic comedies too... Thanks for sharing with us. Enjoyed reading your post. We've got a lot of film-making go on here in Massachusetts. I am looking forward to this movie. Jennifer Garner's husband is in town now filming a movie right here in Massachusetts. Your going to the chapel music was used in the closing credits for one of my favorite romantic comedies, Four Weddings and a Funeral. What a cozy and lovely virtual home you've created here. I've enjoyed my visit here very much.... and so nice meeting you! Wonderful post. I will have to get out around Stowe and see what NE has to offer us. stumbled upon your blog. My co-worker's daughter was there the day they were filming at the chapel. She is 12 and was SOOO excited to meet her. Pretty neat! I love this little chapel so much. My own sister Margaret was married here. 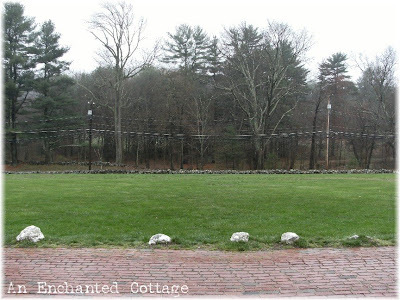 The reception was at the Inn which was quite beautiful because it was in January and she arrived in a horse drawn sleigh. They had the huge fireplaces burning and I swear everyone who attended was a history buff. I just saw the movie "Ghosts of Girlfriends Past" tonight, for one because I'm a big Jennifer Garner fan and two, I, myself got married inside Martha & Mary Chapel on Oct. 1, 1994, so seeing that beautiful place in the movies is really cool. I definitely have to see this movie. My husband and I were married there on September 14, 2002. What amazing memories I have of that beautiful chapel! 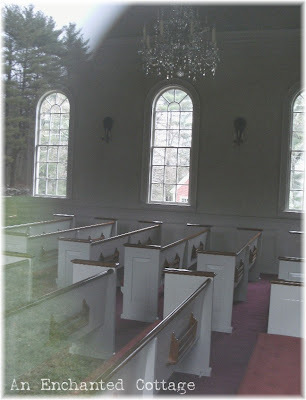 My husband (military) was stationed in the Boston area for only a year, but we visited Longfellow's Wayside Inn several times that year and completely fell in love with it, including the chapel. I took my mother, a West Texas native, to see it when she was up for a leaf-peeping visit. She said, "That's it. That's what I've always thought a chapel should look like. It's just perfect!" We took lots of photos with the fall colors, too. So... a few weeks ago, my husband and I rented and watched "Ghosts...," not knowing they filmed in Sudbury. I nearly jumped off the couch when I saw that beautiful chapel. I would know it anywhere! By the way, I hear Jennifer Garner filmed part of another movie there after "Ghosts..." Will have to keep an eye out, now.